For the latest events and special offers visit Kaspa’s Desserts website, Facebook, Instagram or Twitter pages. 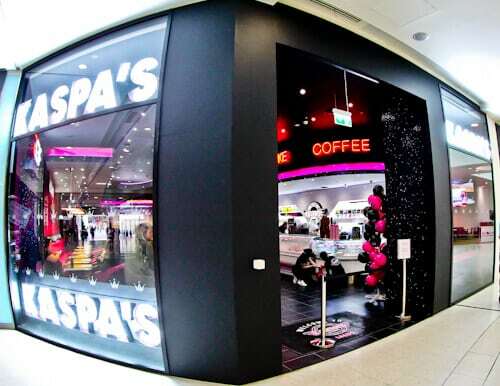 Kaspa’s Leeds is located in The Core shopping mall in Leeds city center. You can see the bright lights of Kaspa’s from The Headrow, even if you’re just driving past! The Core has recently undergone a multi million pound refurbishment and is now one of the best malls in Leeds. It has it’s own car park and is located 10 minutes walk from Leeds train station. With the funky interior at Kaspa’s, Leeds you’ll be transported from West Yorkshire to 60’s America. Everybody likes to sit in a booth and there are plenty of booths available. The interior is very Instagrammable and whilst you’re taking that selfie, bear in mind there’s a selfie of the week competition. Before uploading your selfie to Instagram, add #kaspas for a chance to win a free dessert voucher. At the dessert bar you can check which flavor ice-cream or which type of cake you like the look of before looking through the menu. Even if you know what you want already, it’s always pleasing on the eye checking out a huge display of desserts. 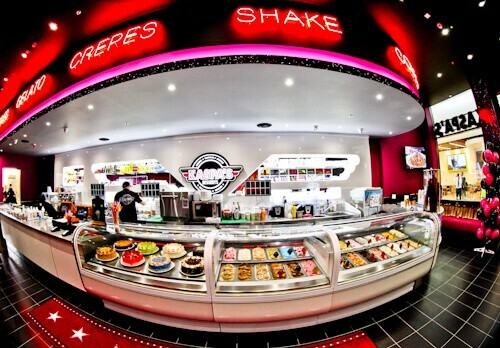 You can see desserts and shakes being prepared behind the bar, you are sure to see something you like! 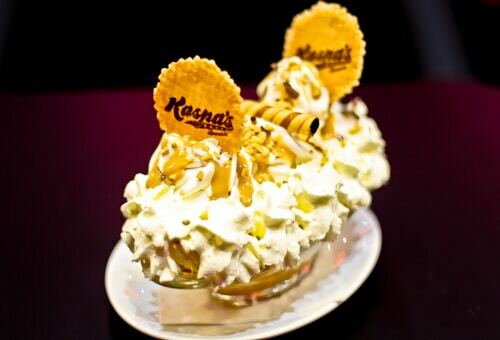 The Kaspa’s Leeds venue is perfect for birthday parties, in fact the largest dish on the menu is the Birthday Extravaganza which is 15 scoops of ice-cream on a bed of waffles, various toppings, syrups, whipped cream and wafers. The classic banana split is delicious, huge and it costs less than £6. In this dessert there is a fresh whole Banana, vanilla ice cream, chopped nuts, chocolate sprinkles, toffee syrup, fudge cubes, all topped with whipped cream and an Instagrammable Kaspa’s wafer. The fudge cubes are delicious, you’ll find them at the bottom and it’s fun searching for them. Due to the size of this banana split I’d recommend sharing, if you decide it wasn’t enough you can always order another! There are several sundaes available on the menu from a Very Cherry Sundae to a Giant Tutti Frutti. 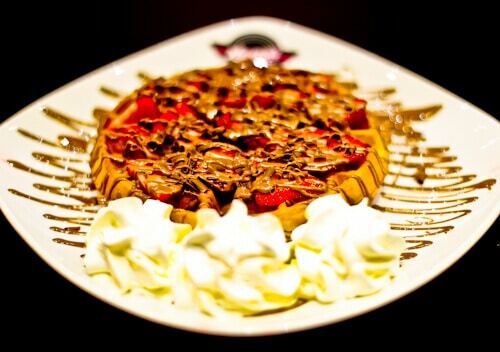 Waffles are delicious, especially when they are covered with fresh strawberries and topped with melted chocolate. The portion sizes are big (above) and the price is less than £6 which is incredible considering that the strawberries are fresh. There are 18 different ways you can order your waffle from a Canadian maple waffle to an M&Ms waffle. If it’s crepes you crave, you can order anything from a crepe drizzled in melted Belgian chocolate to a bananaberry crepe. Check out the full crepes and waffles menu online before your visit. There is a huge selection of cakes at Kaspa’s, you can check out the cake menu or better still go up to the dessert bar and choose the slice you want. I tried the Oreo Cookie Base Cake which was delicious but I would have loved to have tried every cake from the dessert bar. 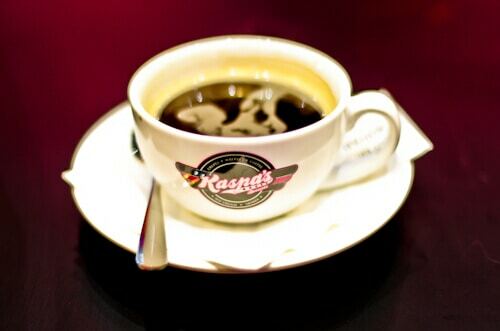 Kaspa’s offers a large selection of hot drinks, variations of coffee, tea and hot chocolate. 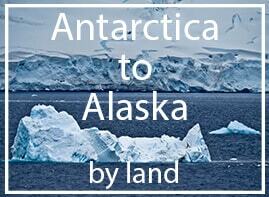 Cold drinks available include milkshakes, ice cream scoop shakes, soda floats, protein power shakes and smoothies. For the latest events and special offers check out the Kaspa’s Leeds, Facebook, Instagram or Twitter pages. 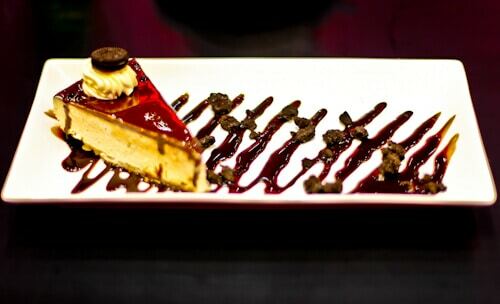 Enjoy your desserts at Kaspa’s Leeds. Kaspa’s have a good range of delicious desserts! I liked their food presentation in your pictures too. With my sweet tooth, I’ll totally love to taste everything that’s here! The Banana split looks way too yummy and I love that Strawberry Indulgence too! Free Milkshake on birthday? Wow, that’s a very nice touch! Oh yum! This has such a retro vibe to it, which I love! I’m crazy about dessert, so I’d definitely make Kaspa’s a stop and how cool to get a free milkshake for your birthday! From the ones you pictured I’d choose the banana split! I haven’t been into the Core for a while and especially not since it has been refurbished but with Kaspa’s, I have a reason to pop in now! The food looks incredible (and your food photography is great!) I’m a sucker for both waffles and crepes so i’ll definitely have to visit some time soon. I really like the sound of the maple waffle! The classic banana split seems so delicious. I am happy to see big portion size. I am big fan od waffle, especially if it is served with maple syrup. I am yet to try crepes though. 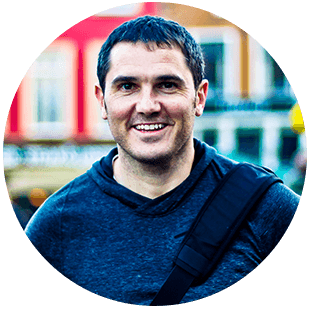 Damn, your blog made me hungry! The dessert bar looks incredible! Hot coffee and ice cream is one of my favorite desserts. But, I would gladly join you to sample every cake in the bar! Oh man, this place looks ridiculous. In a good way, of course. That it’s in a mall is a bit of a bummer (I’d love to eat the ice cream on a street-side patio), but it sounds like the desserts more than make up for it. Kaspa’s looks like a pretty place and even prettier and delicious dessert and drinks. I would love to try that Banana Split with a cup of hot chocolate. And it’s amazing you get a free milkshake as a little birthday gift. Wow, the pink and black colors make Kaspa’s look like something out of a futuristic zone! Good location too! The Strawberry Indulgence is interesting. I wonder, has anyone ever finished the entire 15 scoop Birthday Extravagance? It’s been many, many years since I have visited Leeds! Probably about 15 actually. Strange as my brother lives there. If I ever make it over that way to see him I’ll be sure to check Kaspa’s out, just for the dessert!! Oh I wish I hadn’t read this while on the train to work! Now I want waffles and fresh coffee. Not a squished train ride ???? Your photos are mouth watering good!! This must have been such a tough review to do… all those deserts, poor you! Seriously, it looks amazing! My little girl would love the bright interior and I think we’d all go crazy over the ice cream. I wonder if many people finish the birthday extravaganza by themselves? The neon signs plus the bright pink colour of the pieces of furniture make me feel that I am going to enter a disco club. The desserts look delicious, appealing, and well plated. I would love to try the crepes and waffles. I am a foodie and I have an eye for great presentations, beautiful ambience and colourful interiors. Kaspa’s looks great and I think I will have to go there for the crepes. 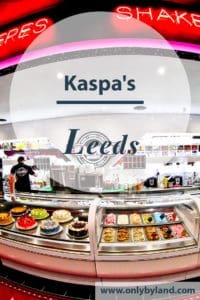 Kaspa’s Leeds looks like the place for dessert lovers. Sadly, nothing on this menu looks dairy free for myself, but the waffles drizzled in chocolate sauce and topped with strawberries looks delightful! Fun atmosphere as well with the decor. That oreo cookie based cake looks unreal! It makes me wish I lived nearer to Leeds! I’m also a big milkshake fan, do Kaspas serve up American sized portions too?! Definitely one to bookmark when I’m next there. 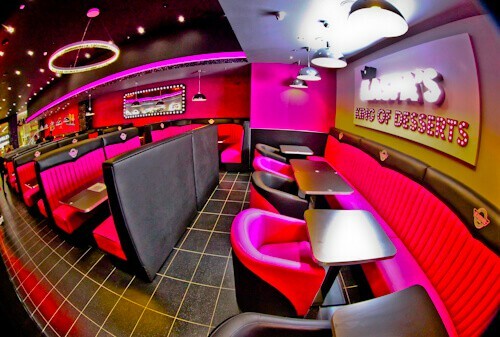 Interiors of Kaspa Leeds is so sleek and pink color decoration looks like a upscale disco. Perfect place for celebrating as it has lot of yummy options.Banana Split and Strawberry indulgence really look like a treat. Your post make me hungry and craving for sweet now.